Has long record of outrageous activity. Is this a warning where the Republican Party will go in the next few years? (MassResistance) The Republican establishment in Washington is pouring enormous amounts of money -- over a million dollars -- into Massachusetts to elect an aggressive, anti-family homosexual activist to Congress. 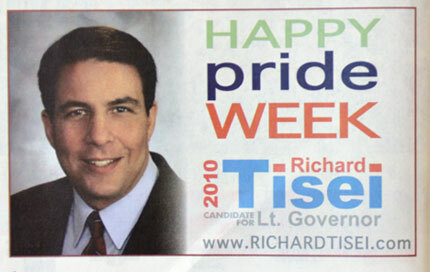 In Massachusetts, Richard Tisei is known as an openly "gay" liberal Republican politician who ran for Lt. Governor in 2010. Prior to that as a State Senator, among other things he worked to successfully block the people's right to vote on the Marriage Amendment. Salute to his "community." Advertising in the Boston "Gay Pride Week" official program in 2010. Tisei is the only Republican Congressional candidate in Massachusetts to receive such support from the national Republican Congressional campaign!.. Abortion. Strongly supports abortion. Rated 100% by NARAL and 100% by Planned Parenthood. Abortion buffer zone. Co-sponsored the bill that expanded the buffer zone around abortion clinics. Not to sound the least bit sarcastic, but surely you are aware that this is very old news. Old in the sense that the Republicans have been supporting clowns like this far, far longer than you may think. They are perfectly comfortable with the homosexual perversion and certainly will not rock the boat on this issue. The abortion question is much the same. While talking negatively about abortion these Republican cowards get the endorsements of the various (and clueless) "right to life" committees and then do absolutely nothing to slow down this murderous juggernaut when in office. So their chumming around with fairies should surprise no one. The Republicans are merely the conservative wing of the ruling liberal party. They have done nothing whatever to stop these horrors. Remember the 1994 "Contract with America"? Recall all the wonderful pro-life Supreme Court justices we were going to get under the Republicans? I have long stopped listening to this awful semi-annual puppet show.